Some say that basketball is just a game. This is true. However, that game has the power to move people to tears, evoke unbridled joy, bring friends, teammates and even strangers together and create heart-warming memories that last a lifetime. The 2003 championship game of the NCAA Tournament between Syracuse and Kansas left an indelible impression on me. I watched it with my friend Gary. In a sense, we were like millions of other basketball fans around the country taking in the game with their buddies, but it felt different. Gary was sick. In March of that year, doctors found a cancerous tumor in his brain. They removed as much as they could and Gary underwent radiation treatment. The outlook was bleak, but you would not have known it from his demeanor. My friend refused to let the tumor or the fatigue caused by radiation slow him down. He had too much living to do. Gary reconnected with old friends, went to ballgames, attended cultural events and inspired his friends and family with his optimism and enthusiasm. Gary and I met as students at the University of Michigan. I knew early on that there was something special about him. He was a passionate person who loved people and experienced life on a deeper level than most. We were friends, but not extremely close. That changed when he got sick. Barriers melt away when a person is facing death. There were no secrets between us. No need to put on airs. We talked about life, love, death and friendship in ways I never had before. In early April, he invited me over to watch the Syracuse-Kansas game. I distinctly remember being depressed on my way to his parents’ house. I was worried about my friend and sad that he and his family had to deal with such a horrible illness. The night played out like every other time I visited Gary during that period: I was intent on lifting his spirits, but inevitably he lifted mine. I was surprised by his enthusiasm for Anthony and the Syracuse team. Gary preferred the NBA to college basketball. It was one of the things we had in common. We shared a devotion to the New York Knicks. I told him I knew of Anthony, but admitted that I had not seen him play very much. That made Gary even more excited. He knew I was a big hoops fan and could not wait to share the experience of watching Anthony with me. Gary’s father Mario watched the game with us. We shared laughs and enjoyed great basketball. The game went down to the wire and Syracuse pulled out an 82-78 victory. Anthony scored 21 points despite a sore back and every time he did something special Gary smiled at me, as if to say “I told you so.” Anthony was named the tournament’s Most Outstanding Player. Gary and I hung out together several more times over the next six weeks. He joked about his hair falling out and shared his deepest fears. His spirits were high. He was enjoying life and remained optimistic about his future. Shortly after Memorial Day I received a phone call from a mutual friend informing me that Gary had slipped into a coma. He passed away on October 1. It broke my heart. I recently watched the latest film from ESPN’s 30 for 30 series, “Survive and Advance” about the miraculous 1983 NC State basketball team and their coach Jim Valvano, who waged his own courageous battle against cancer. In the film, Duke coach Mike Krzyzewski referred to the period when Valvano was sick as “four of the most beautiful months I’ve ever had of friendship with anyone.” That is how I feel about Gary. I still think about my friend often. Little things trigger memories, like driving past Mario’s Pizzeria in Syosset or hearing certain Grateful Dead songs. 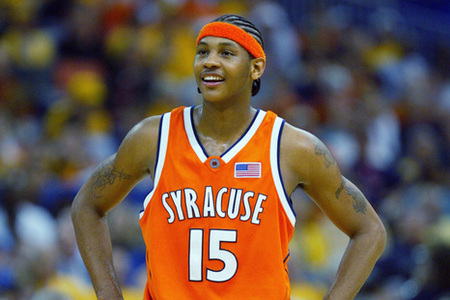 I thought about how excited he would have been when Carmelo was traded to our beloved Knicks, and he is always on my mind when the former Syracuse star has a big game. However, I think about Gary most often during the NCAA Tournament. I am still moved by the thought of that 24-year-old with so much to be fearful of and angry about receiving so much joy from a basketball game. Ten years later, Syracuse is back in the Final Four. But Gary would not be pulling for the Orange this time around. They are facing our Michigan Wolverines. I can imagine him gushing over Trey Burke the way he once did about Carmelo. It makes me smile. Thinking about Gary always does. Previous Post Should Louisville Have Continued Playing After the Injury to Kevin Ware? mark prevention cream 1 type its names on a popular search engine. wannts accurate consideration. While Revitol stretch mark cream. One of them is Revitol Stretch Mark Cream pozes several advantages over clinical procedures. Wonderful site you have here but I was curious about if you knew of any discussion boards that cover the same topics discussed in this article? I’d really love to be a part of group where I can get feedback from other knowledgeable people that share the same interest. If you have any suggestions, please let me know. Many thanks! These constituents can easily reduce the appearance of hyper pigmentation, age spots, sun damage melasma, acne marks, old scar, dark elbows and uneven skin tone with ease. Thanks for the kind words knep. Means a lot to us. Makes me smile to hear that you guys still think about him. We do too. Miss you Gary. Will be thinking about you down in Atlanta. Go blue! Nice article and a wonderful organization (Voices Against Brain Cancer) they along with many others raising money to find a cure for brain cancer. That’s good stuff. Miss you, Gary. And yes, Go Blue! I’m happy to know we’re all still thinking about Gary all the time. GO BLUE. Word Pauly Knep. Gary would be proud of this squad. I miss him too. Very touching from a good friend. Thanks for the great story of a great friend.